Herm of Plato. The Greek inscription reads 'Plato [son] of Ariston, Athenian' (Rome, Capitoline Museum, 288). Many Plato interpreters held that his writings contain passages with double meanings, called ‘allegories’ or ‘symbols,’ that give the dialogues layers of figurative meaning in addition to their usual literal meaning. These allegorical interpretations of Plato were dominant for more than fifteen hundred years, from about the first century CE through the Renaissance and into the Eighteenth Century, and were advocated by major figures such as Plotinus, Proclus, and Ficino. Beginning with Philo of Alexandria (1st c. CE), these views influenced Jewish, Christian and Islamic interpretation of their holy scriptures. They spread widely in the Renaissance and contributed to the fashion for allegory among poets such as Dante, Spenser, and Shakespeare. In the early modern period, classical scholarship rejected claims that Plato was an allegorist. After this rupture, the ancient followers of Plato who read the dialogues as sustained allegories were labelled 'Neo-Platonists' and regarded as an aberration. In the wake of Tate's pioneering 1929 article 'Plato and Allegorical Interpretation,' scholars began to study the allegorical approach to Plato in its own right both as essential background to Plato studies and as an important episode in the history of philosophy, literary criticism, hermeneutics, and literary symbolism. Historians have come to reject any simple division between Platonism and Neo-Platonism, and the tradition of reading Plato allegorically is now an area of active research. The definitions of 'allegory,' 'symbolism,' and 'figurative meaning' evolved over time. The word 'allegory' (Greek for 'saying other') became more frequent in the early centuries CE and referred to language that had some other meaning in addition to its usual or literal meaning. Earlier in classical Athens, it was common instead to speak of 'undermeanings' (Gk., hyponoiai), which referred to hidden or deeper meanings. Today, allegory is often said to be a sustained sequence of metaphors within a literary work, but this was not clearly the ancient definition since then a single passage or even a name could be allegorical. Generally, the changing meanings of such terms must be studied within each historical context. 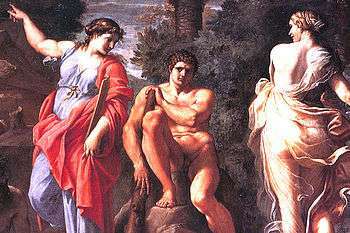 Greek allegory arguably began with personifications in Greek mythology (Eros is love, Athena is wisdom). Greek philosophical allegory may have begun with Parmenides or Empedocles but is clear in Socrates' friend, Prodicus the Sophist, and his famous tale of 'Hercules at the Crossroads.' Discussed by Xenophon, the Neo-Platonists, and many others, it became well-known again in the Middle Ages and Renaissance. On the left, Virtue is calling Hercules to the higher path of glory through hardship, while Vice is enticing him toward the easy life of pleasure (Annibale Carracci, The Choice of Hercules, detail, 1596, National Museum of Capodimonte). The Platonic theory of ideas has two aspects which lead to allegorical interpretations of both signs and things ... To speak of “the idea of a thing” is almost to invoke the allegorical process, for the idea transcends the thing, much as the allegorist's fiction departs from the literal sense of an utterance... More important is the Platonic arrangement of the theory of ideas as a vast hierarchical construct, from lower to higher forms... By questioning the essential value of material nature, the Platonic dialectic opens the way to a spiritualizing of nature, and in the case of Plato himself this leads to the use of allegory precisely at the moment in his dialogues when the analysis of nature has reached the highest point of transcendence describable in natural, human terms. Many believe Plato was influenced by the Pythagoreans. Like other ancient sects, they were reputed to have secret doctrines and secret rituals. Ancient writers, however, especially associated them with 'symbols' used to conceal their secrets. The Pythagoreans seemed to extend the meaning of this term to include short phrases that played the role of secret passwords or answered ritualized riddles. Struck traces the way this usage was further stretched to encompass literary symbolism and thus why the Pythagoreans are sometimes credited with inventing such symbolism. Within the Academy, a famous dispute over the creation myth in Plato's Timaeus shows that some of Plato's earliest followers were not reading the dialogues literally: Speusippus, Xenocrates, and Polemo all interpreted a key passage in the Timaeus figuratively. An inheritance has been handed down from the most ancient to later times in the form of a myth, that there are gods and that the divine surrounds all of nature. The rest [of the ancient stories] were expressed mythically, which is appropriate for convincing uneducated people … They even said the gods had human shapes and were similar to the other animals … If the first [claim], that they believed the gods are fundamental realities, is taken separately [from the mythic stories], then they surely spoke an inspired truth … (Met. 1074a38 – b13). Yet when Aristotle discussed passages in Plato's dialogues he interpreted them literally. Aristotle's writings are hostile to Pythagoreanism and generally to unclear words in public speeches. Aristotle shows either that Plato's immediate students usually read the dialogues literally or that Aristotle himself was never initiated into the Pythagorean sect and thus missed the allegories later readers found in the dialogues. … that Pythagorean doctrines are hidden in Plato, who for one reason or another is reluctant to reveal them, and that true Pythagoreanism can be teased out of Platonic texts by in-depth interpretation… it would seem safe to say that something quite esoteric is regularly being detected beneath Plato's text, concealing details of the allegedly Pythagorean metaphysic that Pythagoreans, almost as a matter of faith, supposed to exist there. Middle Platonism is sometimes thought to have avoided allegorical interpretation, but Dillon's survey found 'relative continuity' with the later Neo-Platonists: 'at least at the latter end of the Middle Platonic period, there were developments in exegesis which anticipated to some extent the allegorizing of the Neo-Platonists.' The routine attribution of hidden meanings to Plato among Middle Platonists can be found, for example, in Plutarch (c. 45 -- 125 CE), a priest of the Elysian mysteries and perhaps a Platonic successor. The earliest depiction of a Roman book cabinet or armarium, with scrolls inside on the upper shelf. 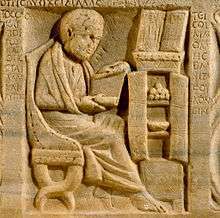 From a sarcophagus dated to 200 -- 300 CE, i.e, about the time Plotinus was in Rome. Though found in Ostia, a port near Rome, the Greek inscription suggests a Greek resident. The open case containing surgical tools on the cabinet top, the other scrolls, and a basin for bleeding patients within the cabinet suggest a learned physician (Metropolitan Museum of Art, N.Y., 48.76.1). Modern historians call the followers of Plato in the early centuries CE ‘Neo-Platonists.’ They were the most important and vigorous advocates of the allegorical interpretation of Plato. 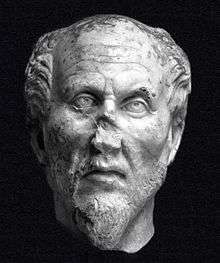 Plotinus, regarded as the founder of Neo-Platonism, often says that Plato‘s dialogues have ‘undermeanings’ (hyponoiai). His Ennead III.5 is an extended allegorical interpretation of passages from Plato's Symposium. Writings of a genuinely profound and theoretical character ought not to be communicated except with the greatest caution and considered judgement, lest we inadvertently expose to the slovenly hearing and neglect of the public the inexpressible thoughts of god-like souls (718, cf. 1024). Proclus claims that the Parmenides generally communicates its meaning through allegory or undermeanings. A teacher, he says, does not 'speak clearly, but will content himself with indications; for one should express mystical truths mystically and not publicize secret doctrines about the gods' (928). The dialogue's method of instruction is 'to employ symbols and indications and riddles, a method proper to the most mystical of doctrines ...' (1027). That is why Plato, when he was moved to speak about the Good, did not dare to tell what it was ... philosophers make use of fabulous narratives (fabulosa); not without a purpose, however, nor merely to entertain, but because they realize that a frank and naked (apertam nudamque) exposition of herself is distasteful to Nature, who, just as she has withheld an understanding of herself from the uncouth sense of men by enveloping herself in variegated garments, has also desired to have her secrets handled by more prudent individuals through fabulous narratives... Only eminent men of superior intelligence gain a revelation of her truths ... (I.17-18). 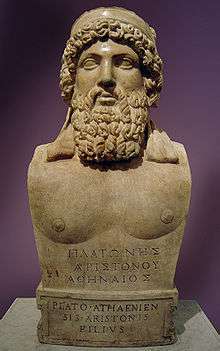 In the Hellenistic period (3rd -- 1st centuries BCE) allegorical interpretation was predominately a Greek technique associated with interpreters of Homer, the Stoics, and finally Plato. Philo of Alexandria (c. 25 BCE – c. 50 CE), a Jewish scholar with a Greek education, systematically applied the allegorical approach to the Jewish scriptures. This had far-reaching consequences for later controversies over methods for interpreting the Christian Bible and these in turn set the stage for the modern rejection of allegorical interpretations of Plato. Philo of Alexandria believed that the doctrines in Plato's dialogues and Jewish scriptures (the Torah) were so similar that Plato must have borrowed his philosophy from the Jews. Philo held that, before Plato wrote his dialogues, he must have traveled to Egypt and studied the teachings of the Jewish prophet Moses. Philo's wide-ranging, allegorical re-interpretations of Jewish scripture even found evidence that Plato's Theory of Forms was known centuries before Plato. Philo's theories had little immediate effect upon Jewish theologians, who seem never to have mentioned him or his voluminous writings. Oxford University’s 1492 edition of Plotinus' Enneads, translated into Latin by Ficino, with its original stamped, checkerboard binding in calf over wooden boards. Holes for chain staples and the manuscript title on the text block show chained volumes were shelved with spines to the rear. This copy is thought to have belonged to the royal library of King Philip II of Spain. Allegory was a powerful tool that allowed Philo to interpret [Jewish] Scripture in the light of Platonism... Origen tends expressly to refer to Philo as a predecessor precisely in points that are crucial to his Scriptural allegorical method. This strongly suggests that Philo was his main inspirer for the very technique of philosophical allegoresis of Scripture, and that Origen both was well aware of this and acknowledged his debt... Philo was the first systematic philosophical interpreter of the Bible who read it allegorically, and Origen was the first, and the greatest, who did so in Christianity. To maintain the fourfold sense was for mediaeval Romanism [that is, the Catholic Church] a matter of life and death. It was necessary for her power that dogmatic prepossession and traditional authority should reign supreme. The more ingeniously texts were manipulated in her interests, the more loudly she proclaimed that such interpretations alone were "spiritual " and were due to "illuminating grace." In sum, the techniques of allegorical interpretation applied to Plato's dialogues became central to the European tradition of reading both philosophical and -- after Philo's intervention -- religious texts. The degree to which Neo-Platonism and its allegorical methods influenced Muslim tradition is controversial and different scholars have different views. It is clear that the writings of Plotinus, Proclus, and other Neo-Platonists were translated into Arabic from an early date. Blending with local traditions, allegory and allegorical interpretation thereafter became central to Muslim philosophy, theology, and literature. To varying degrees, they influenced Muslim philosophical theologians such as Al-Kindi (d. c. 866), Al-Farabi (c. 870 -- 950), Avicenna (980 -- 1037), and Averroes (1126 -- 1198). On the other hand, some verses in the Qur'an are regarded as allegorical and some see this as an early endorsement of allegory. Some Islamic sects, such as Sufism, are largely based on allegorical interpretation of the Qur'an. 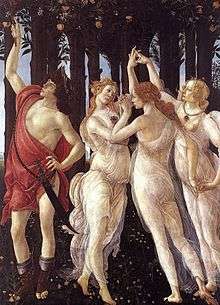 Botticelli's Primavera (detail, c. 1482). Florentine painters led the Renaissance shift from religious to pagan, allegorical themes. Lorenzo de' Medici was the patron of both Botticelli and Ficino, and extant letters suggest Ficino may have been consulted about the subjects of Botticelli's paintings. All mediaeval thought up to the twelfth century was Neoplatonic rather than Aristotelian; and such popular authors of the Middle Ages as Augustine, Boethius, and the Pseudo-Dionysius carried Christian Neoplatonism to England as they did to all other parts of Western Europe. From the Twelfth Century, the works of Aristotle became increasingly available and his philosophy came to dominate late medieval Scholasticism. Their publication ... was an intellectual event of the first magnitude since they established Plato as a newly discovered authority for the Renaissance who could now take precedence over Aristotle, and whose work ... was of sufficient profundity to be set above his rival's. Bust of Marsilio Ficino in the cathedral in Florence (by A. Ferrucci, 1521). He seems to play his translation of Plato like a lyre. In the Sixteenth and Seventeenth Century, the Protestant Reformation and the religious wars that devastated much of Western Europe were in significant part about religious authority and therefore about how to interpret the Bible. Protestants charged that many Catholic traditions and doctrines (even the dogma that God was a Trinity) had no basis in the Gospels; Catholics asserted an expertise in reading the Bible that gave them special access to its deeper truths. The ancient technique of allegorical interpretation, the mainstay of Catholic exegesis, thus became a fiercely contested political issue. This controversy came later to transform the way Plato was read. Catholics responded at the Council of Trent that only the Church and its traditions could authoritatively interpret the meaning of the Bible. The European wars of religion (16th -- 17th c.) were in part about religious authority and whose interpretation of the Bible was legitimate, and thus allegory became a political issue. In just the Thirty Years War (1618 -- 1648) there were perhaps five to ten million casualties and the German population was reduced in some regions by 25 to 40 percent. Depiction of the Battle of White Mountain, one of the decisive battles of the Thirty Years War, by Pieter Snayers (1620, Bayerisches Armeemuseum, Ingolstadt). Protestant scholars began critical studies of the text of the Greek New Testament that led to a re-appraisal of all ancient literature. Protestants soon came to emphasize that the 'Alexandrians' or Neo-Platonists had introduced allegorical interpretation into Christianity, and thus hostility to allegory became hostility to Neo-Platonism. 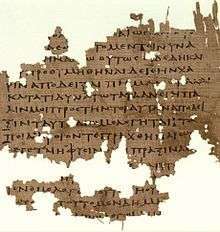 Violent disputes soon raged over whether the Neo-Platonists had corrupted the early Christian theologians and thus led the Church away from the 'pure' Christianity of the Gospels. The Eclectic sect [of Neo-Platonists], thus raised upon the foundations of superstition, enthusiasm [i.e., mysticism], and imposture, proved the occasion of much confusion and mischief both to the Christian religion and philosophy... Pagan ideas and opinions were by degrees mixed with the pure and simple doctrine of the Gospel ... [and] corrupted the pure religion of Christ; and his church became a field of contention, and a nursery of error. The Eclectic sect [later called Neo-Platonists] is not commonly known among ancient writers under any distinct name; for this obvious reason, that its most celebrated supporters chose rather to pass themselves upon the world as Platonists, than to assume a new title; but that the sect really existed as such [as a separate sect with novel doctrines], no one, who attends to the facts ... can entertain a doubt... They endeavored to conceal the absurdities of the ancient [Pagan] religion by casting over its fables the veil of allegory, and thus represented them as founded upon immortal truths... the Alexandrian philosophers, though they founded their system chiefly upon the doctrine of Plato, departed from him in many particulars. For Brucker, the allegorical commentators on Plato were `mad, liars, impostors, vain and foolish forgers of a most detestable and false philosophy ...’ Thus by the mid 1700's, allegorical interpretation was blamed on the Neo-Platonists and the Neo-Platonists were no longer Platonists. Brucker's negative view of Neo-Platonism was spread across Europe by the French Encyclopedia of Diderot and D'Alembert, which labelled Neo-Platonism a 'superstition' in the article Eclectisme. The decline of allegorical interpretations of Plato was part of a European-wide rejection of traditional allegory across literature, religion, and philosophy. During the Seventeenth and Eighteenth Centuries, '... allegory is forced out by the standard-bearers of modernity: empiricism, [rigorous] historiography, realism, and plain, rational speech... these shifts produced the end of allegory based on Platonic Ideas, Christian theology, or syncretic versions of these ...' Goethe (1749 – 1832) famously elevated the 'symbol' and denigrated allegory in his Maxims and Reflections. 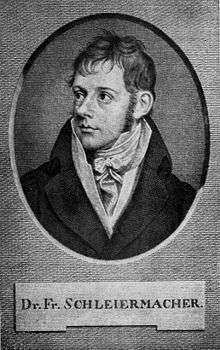 In classical scholarship, the work of Friedrich August Wolf (1759 – 1824) marks the final rejection of allegorical methods. He influentially advocated that classics should turn from literary methods and become a more rigorous 'science of antiquity' (Altertumswissenschaft). 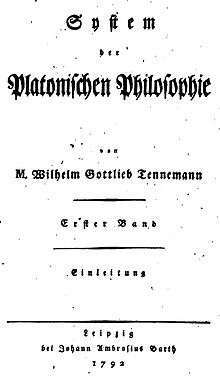 Tennemann, System of Platonic Philosophy (1792) Said to be the first, modern monograph on Plato, Tennemann's study interpreted Plato as a rationalist, and believed a logical, philosophical system lay concealed in the dialogues. After early modern Protestant scholars ended the tradition of reading Plato allegorically, German philosophers developed new ways of finding deeper meanings in Plato. These 'modern esotericists' later assembled historical evidence that, they argued, showed that Plato expounded secret or esoteric doctrines orally that were transmitted through his students and their successors. These approaches reject ancient and Renaissance allegoresis but retain the distinction between the surface, literal meaning of the dialogues and Plato's concealed, esoteric doctrines. ... to that analytical exposition [of Tennemann's] which we now have been in possession of for a short time, in perfection far exceeding former attempts, it is a necessary supplementary process to restore to their natural connection those limbs, [the dialogues,] ... as expositions continuously more complete as they advance ... so that while every dialogue is taken not only as a whole in itself but also in its connection with the rest ... [Plato] may at last be understood as a Philosopher and a perfect Artist. In the middle of the Twentieth Century, the so-called Tübingen School, initiated by the German scholars Hans Joachim Krämer and Konrad Gaiser, pushed esoteric interpretations of Plato in a novel direction. It is well-known that Aristotle refers to Plato's 'unwritten teachings' and that Plato's followers attribute metaphysical theories to him that are not spelled out in the dialogues. The Tübingen School collects further references to these metaphysical theories from later in antiquity and concludes that Plato did in fact have a systematic, oral teaching that he kept out of the dialogues. This is esoteric in the literal sense: Plato taught it within the walls of his school. These oral teachings were supposedly transmitted down through the centuries, and this accounts for the reliability of the evidence from late antiquity. The Tübingen School was famously attacked by the prominent American scholars Harold F. Cherniss and Gregory Vlastos and English-speaking scholars thereafter tended to be skeptical. In 1974, however, Findlay published Plato: The Written and Unwritten Doctrines that similarly used evidence from the Neo-Platonists to discern Plato's unwritten doctrines. In 1983, Kenneth Sayre argued that the dialogues properly interpreted contained definite allusions to Plato's esoteric metaphysics. Adherents of the Tübingen School are common in Germany and Italy but in 2012 Nikulin remarked '... the majority of the scholars in the Anglo-American world remain unconvinced that the Tübingen interpretation offered a glimpse into the historical Plato.' John Dillon, however, has argued for a moderate view. He accepts the early evidence that Plato had a more elaborate metaphysics than appears in the dialogues, but doubts there was any continuous, oral transmission in later centuries. ...the divide between Middle Platonism and Neoplatonism is justified on the part of Brucker by means of assumptions that are untenable. Hence it becomes very difficult to maintain a divide between the two periods ... I think we ought to abandon the divide completely, since it cannot be justified in the essentialistic manner proposed by Brucker. Given the fact that the division obscures more than it reveals, we would be better off without it. Thus recent scholarship has transformed Neo-Platonism from an aberration that could be ignored into a phase of Platonism. Although Kahn does not see any extensive use of allegory or symbolism in Plato’s dialogues, his approach calls for a kind of subtle interpretation that reaches conclusions he compares to those discovered by Neo-Platonist allegoresis. ↑ For Ficino's influence on Spenser and Shakespeare, see Sears Jayne, 'Ficino and the Platonism of the English Renaissance,' Comparative Literature, v. 4, no. 3, 1952, pp. 214-238. ↑ J. Tate, Classical Quarterly, v. 23, no. 3-4, p. 142 ff. ↑ For a brief but general overview of the history of allegory, see Luc Brisson, How Philosophers Saved Myths: Allegorical Interpretation and Classical Mythology (Chicago: The University of Chicago Press, 2004). Translated by Catherine Tihanyi. ↑ Plutarch says “allegories … which the ancients called undermeanings” in an essay in the Moralia: De Audiendis Poetis, 4.19. Plato (Rep. II. 378d), Euripides (Phoenicians 1131-33), Aristophanes (Frogs 1425-31), Xenophon (Symposium III, 6), all use hyponoia to mean what is later subsumed under allegory. See Jean Pépin, Mythe et Allégorie (Paris: Etudes Augustiniennes, 1976), pp. 85-86. ↑ P. Struck, Birth of the Symbol (Princeton: Princeton University Press, 2004). ↑ See Xenophon, Memorabilia (2.1.21–34) and Robert Mayhew, Prodicus the Sophist: Text, Translation, and Commentary (Oxford: Oxford University Press, 2012). ↑ For Anaxagoras and Metrodorus, see Diogenes Laertius, II.1 and Plato's 'Ion,' 530c3-d3. For Antisthenes the Cynic, see the discussion in R. Pfeiffer,History of Classical Scholarship: from the beginnings to the end of the Hellenistic Age (Oxford: Clarendon Press, 1968), p. 36. See Robert Lamberton, Homer the Theologian: Neoplatonist Allegorical Reading and the Growth of the Epic Tradition (Berkeley: University of California Press, 1989). ↑ According to Plato's dialogue the 'Cratylus,' most interpreters at that time treated Homer allegorically. Socrates says 'Indeed, even the ancients seem to think about Athena just as those who are currently skilled concerning Homer do. For the majority of these in interpreting the poet say that he has made out Athena to be mind and thought' (407a8-b2). ↑ A. L. Ford, The Origins of Criticism: literary culture and poetic theory in classical Greece (Princeton: Princeton University Press, 2002, p. 86-7. ↑ Angus Fletcher, 'Allegory in Literary History,' in Dictionary of the History of Ideas online at http://xtf.lib.virginia.edu/xtf/view?docId=DicHist/uvaBook/tei/DicHist1.xml&query=Dictionary%20of%20the%20History%20of%20Ideas, pp. 43-44. See also A. Fletcher, Allegory: The Theory of a Symbolic Mode (Princeton: Princeton University Press, 2012). ↑ Walter Burkert, Lore and Science in Ancient Pythagoreanism (Cambridge: Harverd University Press, 1972) and W. Burkert, Ancient Mystery Cults (Cambridge: Harvard University Press, 1987). ↑ This late reputation for secrecy is already attested in the fourth century by Aristotle (in Iamblichus, Vit. Pit., 6) and by his sometime student Aristoxenus (D. L. 8.15-16). See also Burkert, op. cit., 1972, p. 179, cf. n. 96. In ancient Greek, the word 'symbol' originally meant the broken half of some small object which two parties split apart in order to use the matching pieces as proofs of identity. ↑ Peter T. Struck, Birth of the Symbol: Ancient Readers at the Limits of Their Texts (Princeton: University Press, 2004). ↑ For a brief, recent overview, see Tarrant, 'Platonic Interpretation and Eclectic Theory,' in Tarrant and Baltzly, Plato's Early Interpreters (Duckworth, 2006), p. 10. ↑ As emphasized by Pépin, op. cit., p. 121 ff. (with references to earlier debates), Brisson, op. cit., p. 38 ff., and others. ↑ See, for example, the extensive discussions of Plato's Republic in Aristotle's Politics. ↑ For criticism of the Pythagoreans see, e.g., book II of De Caelo; for his contrast between clear speech, metaphors, and enigmas, see On Rhetoric, III.2). ↑ Dillon accepts the view of Proclus (In Tim. I 76, 1-2) that Crantor '... perhaps makes his most distinctive contribution to the history of Platonism, the idea of a commentary' (Dillon, Heirs of Plato (Oxford, Oxford University Press, 2003), p. 218). ↑ R. J. Hankinson, The Skeptics (New York: Routledge, 1995), ch. V.
↑ Dörrie, Von Platon zum Platonismus (Düsseldorf: Westdeutscher Verlag, 1975), pp. 35, 42, surveys and periodizes the various ancient approaches to Plato's dialogues. See also references below. ↑ See Burkert, op. cit. ↑ See esp. H. Tarrant, 'The Phaedo in Numenian Allegorical Interpretation,' in S. Delcomminette et al., Ancient Readings of Plato's Phaedo (Leiden: Brill, 2015), pp. 135 -- 153. ↑ des Places, Numenius (Paris: Les belles Lettres, 1973). ↑ H. Tarrant, Plato’s First Interpreters (London: Duckworth, 2000), pp. 84 – 85. ↑ John Dillon, 'Pedantry and Pedestrianism? Some Reflections on the Middle Platonic Commentary Tradition,' in H. Tarrant and D. Baltzly, Reading Plato in Antiquity (London: Duckworth, 2006), p. 24. ↑ See, for example, in Plutarch, Isis and Osiris, p. 370 ff. ; cf. H. Tarrant, Plato’s First Interpreters, op. cit., p. 24. ↑ See his Enneads: IV 2,2; vi 8 22; vi 8 19, iii 4 5; iii 7 13. See also Jean-Michel Charrue, Plotin, Lecteur de Platon (Paris: Les Belles Lettres, 1978). ↑ For a discussion of Proclus' use of allegory, see ch. 4 of A. Sheppard, Studies of the Fifth and Sixth Essays of Proclus' Commentary on the Republic (Göttingen: Vandenhoeck and Ruprecht, 1980). ↑ Page references are to the 1864 edition of Cousin. Translations are from G. R. Marrow and J. Dillon, Proclus' Commentary on Plato's Parmenides (Princeton: University Press, 1992). ↑ For a discussion of Proclus' use of allegory in Plato's Parmenides see Calian, George F. (2013). "'"Clarifications" of Obscurity: Conditions for Proclus's Allegorical Reading of Plato's Parmenides'". Krems: Institut für Realienkunde des Mittelalters und der frühen Neuzeit, 2013, 15-31. ↑ For the above, see Ilaria L. E. Ramelia, ᾽Philo as Origen’s Declared Model: Allegorical and Historical Exegesis of Scripture,᾽ Studies in Christian-Jewish Relations, n. 7, 2012, pp. 1-17. 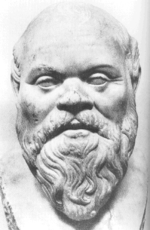 For Philo's relations to Plato, see the writings of David T. Runia, esp. Philo of Alexandria and The "Timaeus" of Plato (Leiden: Brill, 1986). ↑ Ewert Cousins, The Fourfold Sense of Scripture in Christian Mysticism, in Steven T. Katzin, ed., Mysticism and Sacred Scripture (Oxford: University Press, 2000), p. 119. ↑ Ramelia, ᾽Philo as Origen’s Declared Model: Allegorical and Historical Exegesis of Scripture,᾽ op. cit., p. 5. ↑ Frederic W. Farrar, History of Interpretation (London: Macmillan, 1886), p. 201 ff. ↑ Henri de Lubac, published in English as Medieval Exegesis: The Four Senses of Scripture (Wm. B. Eerdmans Publishing Co., 1998). See also Farrar, op. cit., p. 294 ff. ↑ Farrar, p. 299, cf. pp. 296 -- 300. ↑ Majid Fakhry, 'Philosophy and Theology: from the Eighth Century CE to the Present,' in J. L. Esposito, ed., The Oxford History of Islam (Oxford University Press, 2000), pp. 271 -- 3. See also Dimitri Gutas, Greek Thought, Arabic Culture: The Graeco-Arabic Translation Movement in Baghdad and Early Abbasaid Society (London: Routledge, 1998). ↑ For an overview see Fakhry, p. 269 ff. or Parviz Morewedge, ed., Neoplatonism and Islamic Thought (Albany: SUNY, 1992). ↑ Peter Heath, 'Allegory in Islamic Literatures,' Cambridge Companion to Allegory (Cambridge University Press, ), p. 82. See also Mehdi Aminrazavi, 'Mysticism in Arabic and Islamic Philosophy', Stanford Encyclopedia of Philosophy, http://plato.stanford.edu/entries/arabic-islamic-mysticism/ A. L. Ivry, 'The Utilization of Allegory in Islamic philosophy,' in Jon Whitman, ed., Interpretation and Allegory: Antiquity to the Modern Period (Leiden: Brill, 2000). ↑ Kristin Sands, Sufi Commentaries on the Qur'an in Classical Islam (London: Routledge, 2006). ↑ Sears Jayne, 'Ficino and the Platonism of the English Renaissance,' Comparative Literature, vol. 4, no. 3, 1952, pp. 214-238. ↑ M. Allen and M. Ficino, Commentaries on Plato: Phaedrus and Ion (Cambridge: Harvard University Press, 2008), v. I, p. xxiii. ↑ F. Novotny, The Posthumous Life of Plato (The Hague: Marinus Nijhoff, 1977), p. 408. ↑ M. Allen and M. Ficino, Commentaries on Plato: Phaedrus and Ion (Cambridge: Harvard University Press, 2008), v. I, p. xiv. ↑ James Hankins, Plato in the Italian Renaissance, p. 345. (Leiden: Brill, 1990). ↑ M. Allen and M. Ficino, Commentaries on Plato: Phaedrus and Ion (Cambridge: Harvard University Press, 2008), v. I, p. 171. ↑ W. R. Albury, Castiglione's Allegory: Veiled Policy in The Book of the Courtier (London: Ashgate Publishing, 2008), p. 169. ↑ For the views of Protestant historians, see Farrer's The History of Interpretation, op. cit., and A. S. Wood, Captive to the Word: Martin Luther, doctor of sacred scripture (Exeter: Paternoster Press, 1969), pp. 164-5. ↑ Wood, op. cit., 164-5. ↑ For a short survey, see Novotny, op. cit., pp. 507 -- 511. ↑ English translation by W. Enfield: Brucker, The History of Philosophy (London: Thomas Tegg, 1839), p. 344. Original Latin: Historia Critica Philosophiae (Leipzig, 1742–1744), 5 vols. ↑ Brucker, op. cit., p. 345. ↑ Brucker, op. cit., pp. 326, 344, 348. ↑ E. N. Tigerstedt, The Decline and Fall of the Neoplatonic Interpretation of Plato: an outline and some observations(Societas Scientariarum Fennica, 1974), p. 58. ↑ Encyclopédie, ou dictionnaire raisonné des sciences, des arts et des métiers,v. XII, 3rd edition, 1774, p. 682. A 1755 version is online at http://encyclopédie.eu/index.php/science-mathematiques/philosophie/1068928316-ECLECTISME. ↑ Theresa M. Kelley, Reinventing Allegory (Cambridge: University Press, 1997), p. 2. ↑ Goethe, Einzelheiten, Maximen und Reflexionen, 1833 (various editions and translations). See Nicholas Halmi, 'Symbol and Allegory' in Christopher John Murray, ed., Encyclopedia of the Romantic Era, 1760-1850, v. 2, pp. 1113-4. ↑ Jay David Bolter, 'Friedrich August Wolf and the Scientific Study of Antiquity,' Greek, Roman, and Byzantine Studies, v. 21, 1980, pp. 83–99. See also F. A. Wolf, Darstellung der Alterthumswissenschaft (Berlin, 1807). ↑ E. N. Tigerstedt, Interpreting Plato (Almqvist & Wiksell Internat, 1977), p. 68. ↑ English translation by W. Enfield: Brucker, The History of Philosophy (London: Thomas Tegg, 1839), p. 125. Original Latin: Historia Critica Philosophiae (Leipzig, 1742–1744), 5 vols. ↑ Tennemann's interpretation of Plato appeared in his 1792, four-volume System der Platonischen Philosophie (Jena: 1792–1795) and was summarized in his influential History of Philosophy (11 volumes, 1798 – 1819). References below are to the discussion of Plato in the 1799 volume II of Geschichte der Philosophie (Leipzig: Barth, 1799). ↑ Tennemann, Geschichte, v. II, pp. 203, 221. ↑ Tennemann, Geschichte, v. II, pp. 200, 202, 205, 207, 214, 220-1. Brucker's 1742 Critical History already counted Plato an esotericist: 'he purposely threw a veil of obscurity over his public instructions ... This concealed method of philosophizing he was induced to adopt from a concern for his personal safety ...' (Brucker, op. cit, p. 125). ↑ Tennemann, Geschichte, v. II, p. 205 ff. ↑ Tennemann, Geschichte, v. II, p. 216-8, 220-2. ↑ Tigerstedt, Interpreting Plato (Stockholm: Almqvist & Wiksell Internat, 1977), pp. 66-7. ↑ For a discussion of the background and reception, see the introductory essays edited by Peter M. Steiner in Friedrich Schleiermacher, Über die Philosophie Platons: Die Einleitungen zur Übersetzung des Platon (Hamburg: Felix Meiner Verlag, 1996). ↑ References below are to the English translation: W. Dobson, Schleiermacher's Introductions to the Dialogues of Plato (Cambridge: Pitt Press, 1836), p. 11. ↑ This is not the same as the theological movement also known as the 'Tübingen School' and associated with Ferdinand Christian Baur. ↑ For a recent introduction and overview, see Dmitri Nikulin, ed., The Other Plato: The Tübingen Interpretation of Plato's Inner-Academic Teachings (Albany: SUNY, 2012) or Maurizio Migliori, Il Disordine ordinato: la filosofia dialettica di Platone (Brescia: Editrice Morcelliana, 2013). For a brief overview, see David J. Murphy's review (which lists the main texts of the Tübingen School) of Thomas A. Szlezák and Karl-Heinz Stanzel, Platonisches Philosophieren. Zehn Vorträge zu Ehren von Hans Joachim Krämer in the Bryn Mawr Classical Review, http://bmcr.brynmawr.edu/2002/2002-08-06.html. ↑ Hans Joachim Krämer and John R. Catan, Plato and the Foundations of Metaphysics: A Work on the Theory of the Principles and Unwritten Doctrines of Plato with a Collection of the Fundamental Documents (SUNY Press, 1990). ↑ The word 'esoteric' comes from the Greek eso- for 'inside' and teric for 'the walls': originally, therefore, a teaching for insiders. It later came to mean a mystical teaching. ↑ Harold Cherniss, The Riddle of the Early Academy (Berkeley: University of California Press, 1945). See also H. Cherniss, Aristotle's Criticism of Plato and the Academy (Baltimore, 1944). ↑ Gregory Vlastos, review of H. J. Kraemer, Arete bei Platon und Aristoteles, in Gnomon, v. 35, 1963, pp. 641-655. Reprinted with a further appendix in: Platonic Studies (Princeton: Princeton University Press, 1981, 2nd ed. ), pp. 379-403. ↑ John Niemeyer Findlay, Plato: The Written and Unwritten Doctrines (London: Routledge, 2013). ↑ K. Sayre, Plato's Late Ontology: A Riddle Resolved (Princeton: Princeton University Press, 1983) and Metaphysics and Method in Plato's Statesman (Cambridge: Cambridge University Press, 2011). ↑ Dmitri Nikulin, ed., The Other Plato: The Tübingen Interpretation of Plato's Inner-Academic Teachings (Albany: SUNY, 2012), preface. ↑ John Dillon, The Heirs of Plato: A Study of the Old Academy, 347 -- 274 BCE (Oxford: Clarendon Press, 2003), esp. pp. 16 -- 29. ↑ Tigerstedt, op. cit., 1974, pp. 48-9. ↑ Leo Catana, 'The Origin of the Division between Middle Platonism and Neoplatonism,' Apeiron, v. 46, n. 2, 2013, pp. 166-200. See also The Historiographical Concept 'System of Philosophy', (Leiden: Brill, 2008). ↑ C. H. Kahn, Plato and the Socratic Dialogue: The Philosophical Use of a Literary Form (Cambridge: Cambridge University Press, 1996), pp. 65-67.